This week I added full elastic suspension of three 3.5" drives in my Define R4. Since doing it, I've realised I could've done a better job. I would like to refine it, and any advice for that would be appreciated. 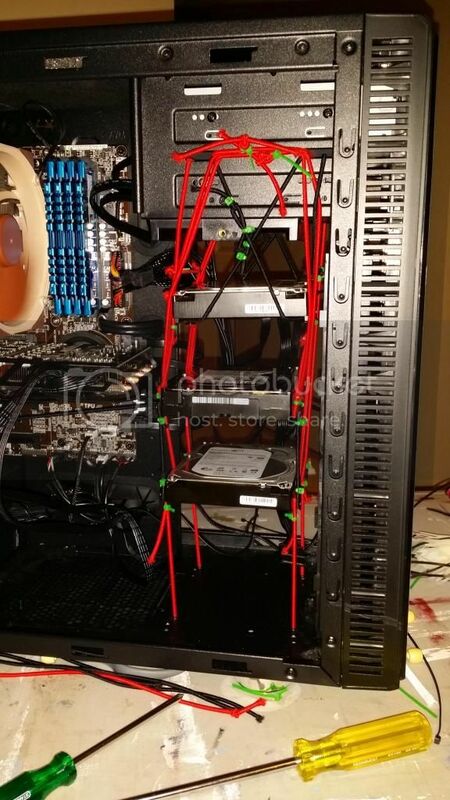 The drives are suspended twice. Firstly, top-to-bottom, with attachments for that on the side screws. The second way is with two loops of elastic hanging down for each drive, and these loop around screws in the bottom of each drive. - The drives are supported both two separate elastic methods. If one fails, the other should still work (in theory). See problems. - Works with the cases own holes, no need to drill/add anything. - Tethering the middle drive to the back of the case pulls it back away from the front fans. 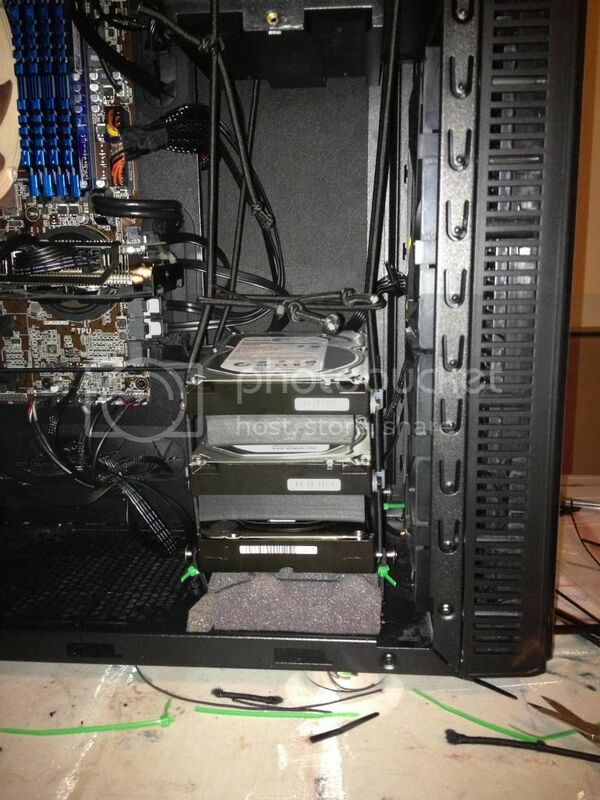 - Quite stable, the drives dont move around much when the moving the case. - Effective in removing vibration noises, no resonance sound issues. - The top-to-bottom ("Link A") elastic connections were done first. So the second hanging-down loops ("Link B) were added after. 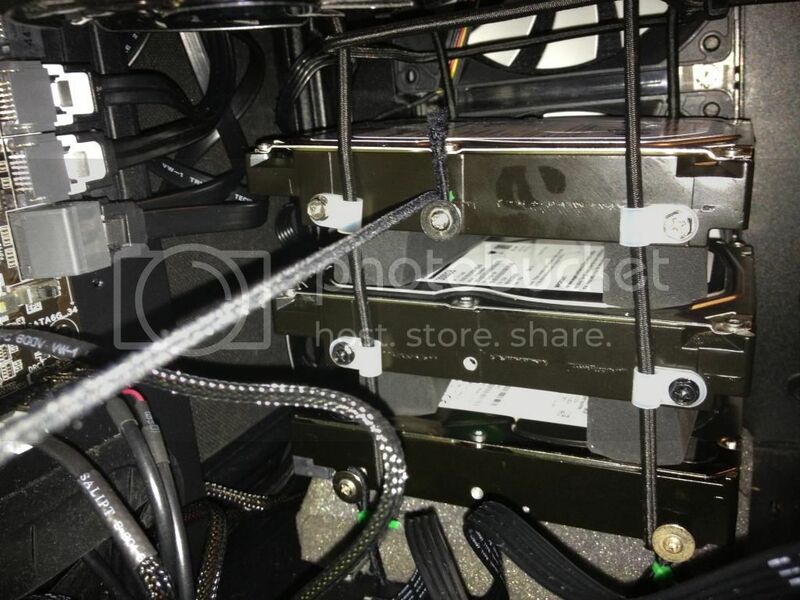 If Link A is removed, without first removing Link B, Link B will pull the drives back up potentially causing them to hit the case or the other drives. - Too much elastic. Very fiddly job to replicate. Could be simplified and refined. 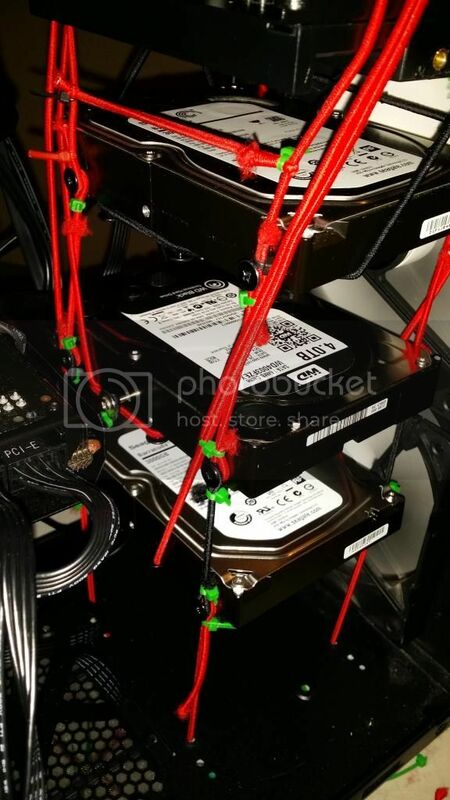 - Set the drives first in the hanging-down position, so the elastic for that is pre-stretched to proper length. Doing this first would prevent the drives from springing up if a link in the top-to-bottom was broken. - Use two elastic cords (double up) for the top to bottom. Keep them as one piece (rather than segmented between the drives like they are currently). Simply cable tie loops along the elastic as you go along. Keep the ties slightly loose and adjust the elastic stretch as needed before fastening. - Use longer drive screws in order to place grommets between the drive and elastics for even more vibration dampening (in theory). - Use an easily adjustable fastener to join the ends of the elastic, making tightening/loosening a much easier job than it is with cable ties. A small enough clamp would be good, but so far the only suitable thing Ive been able to find are resealable cable ties (much easier to loosen than the normal ones). - Above improvements would reduce the amount of elastic, and the time needed to complete the job (it would be much less fiddly). - Add another feature that would somehow reduce the operating noise of my drives (and not just the vibration/resonance). Would be very keen to get your feedback! It looks like scaffolding on a construction site by frenzied aliens. Still, it looks like it should work very well. There are so many different ways to do this, so as long as you're happy... My only concern would be if/when you want to change or add or remove a drive. Is it relatively easy to do or does the whole thing have to come apart? IMO, Aphonos' Dual HDD Bungee-cord Suspension from 2003 still stands out as a really simple, clean modular method. There's a bunch of ways you could probably expand or improve it, too. Looks like a page out of the amazing spiderman! I like the simplicity of that 2003 project. 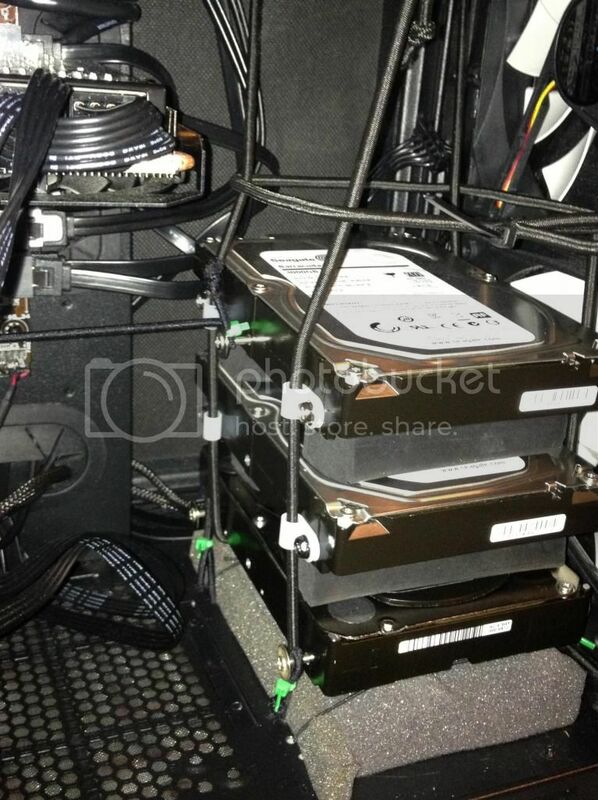 My only concern with it is having those spacers between the drive which could carry vibration. Also, not having tether to the bottom of the case gives them too much free play to move around imo. But as a simple system to work from it is a very good example. I was thinking of placing a shock absorbing material between the drives, not to space them but in case of elastic snap. Here's some poorly shot photos of the new job. Took considerably less time to do. Much neater and easier to do than the previous one. Before changing the suspension, one of the drives had started to make a whine noise. Resuspending them has not removed the noise Its like an electronic mosquito buzzing in your ear. Might also be the PSU... I'll disable the HDDs and check. Update: Yes the noise is coming from one of my Seagate 3TB drives. I think its probably due to it being suspended, bumped, not level, etc. And some notes about the mod itself. The lowest drive is sitting lightly on the acoustic foam, but most of its weight is suspended by the shock cord. I secured the acoustic foam in place with thin elastic, just because it was handy at the time - double sided tape would be the better choice probably. I also attached elastic loosely to the lowest drive, to help prevent the drives moving around too much when carrying the case. The drives are spaced with rubber that is quite soft and quite thick. All the drives are currently at 30 degrees, but only the Black has been active beforehand.